Golden State Warriors star, Stephen Curry and his wife, Ayesha Curry are blessed with two beautiful daughters. Here is everything you need to know about Stephen Curry’s kids, Ryan Carson Curry and Riley Curry. Stephen Curry proved his worth during Game 2 of the NBA Finals. He scored 32 points, 10 rebounds, and 11 assists during Sunday’s game, giving the Golden State Warriors a win against the Cleveland Cavaliers with the score of 132-113. Curry faked out LeBron James during a one-on-one, before finishing with a layup. Fans and analysts have taken to Twitter to comment on Curry’s gameplay. It was his skills that earned him the first unanimous NBA Most Valuable Player vote in 2016, something he thanked his wife for during his acceptance speech. It is not a surprising fact that Stephen Curry’s wife and family are very supportive of his career. 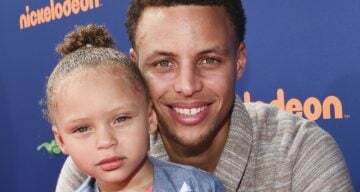 The couple have two adorable children together and Stephen Curry’s daughters are so adorable that they occasionally steal the limelight over their famous father! Riley, his older daughter, already seems to be a star and is constantly photographed when she is with her dad at press conferences. Keep reading for more about Stephen Curry’s children. Curry married his long-time girlfriend and Toronto native, Ayesha Alexander on July 30, 2011. She is a chef with her own cookbook, and is also an actress and model. Stephen Curry’s wife is the host of her own Food Network show, Ayesha’s Home Kitchen, which occasionally features her husband and their kids. While talking about his kids, Stephen Curry said, “I think about the milestones from my childhood, and what it will be like to watch our kids go through them.” Taking Riley to her first day of school was a whirlwind and he cannot imagine her middle school, high school, and ahead of that. With two beautiful daughters to look out for, we can’t say we blame him!